It’s Conservation Week here in New Zealand. 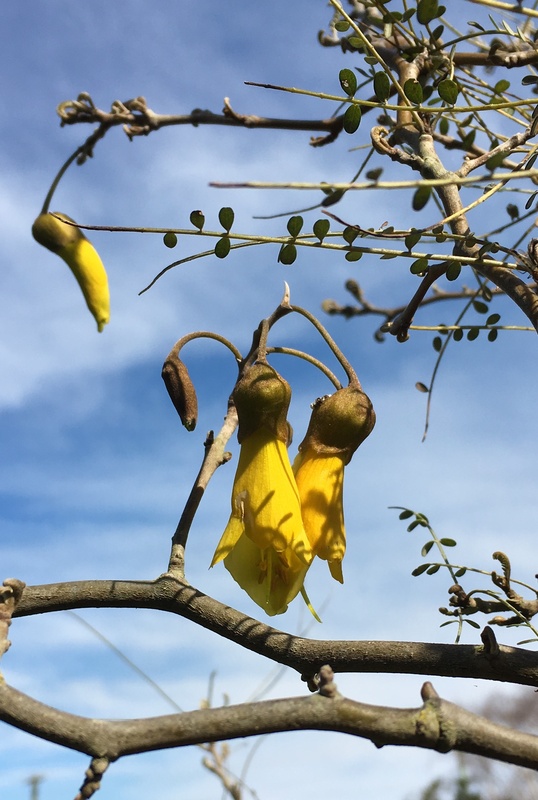 Fittingly, one of the kōwhai trees we planted years ago has chosen this week to flower for the first time. Conservation week is a good time to talk about backyard biodiversity. I’ve blogged more than once about biodiversity issues. It’s a topic near to my family’s heart, and something we strive to improve all the time. Our yard is, unfortunately, home to a wide variety of non-native weeds, but it also sports native plantings (and even a fair number of native ‘weeds’). Here are just a few of the simple things we’ve done to improve the habitat value of our back yard for native organisms. You could do these, too. Plant natives instead of non-natives. Here in New Zealand this is especially important, but it’s a good rule of thumb wherever you live. Native vegetation will best support native wildlife, because they evolved together. Choose plants that provide food and shelter for local wildlife—shrubs with berries for birds and lizards to eat, dense grasses that provide hiding spots for invertebrates, and flowers that provide food for insects. Create lizard refuges. A pile of rocks or a stack of broken terracotta pot shards makes a nice refuge for lizards—the rocks and terracotta warm up in the sun, making a convenient basking spot for the lizards, and the little cracks between ensure a quick, safe get-away when predators appear. Just add water. Birds, insects, and other animals all need water to survive. Provide a bird bath, a small pond, or an attractive water feature, and you’ll find many more animals drawn to your yard. Kill non-native predators. Less important in some places, but here in New Zealand, protecting native birds and lizards requires controlling invasive predators. Trap out possums, stoats, and rats to give native birds a chance to nest successfully. Put a bell on your cat and keep it indoors around dusk and dawn when the birds are most vulnerable. Learn what you’ve got. No matter how small, your yard teems with species. Look closely, and you may be surprised at the diversity. Though our yard tends to be quite dry, we’ve discovered half a dozen species of moisture-loving slime moulds on the property. Once you know you an organism is present, you can tweak your planting and maintenance to protect and encourage it. And that brings me back to the kōwhai tree, finally blooming. It’s not enough, yet, to attract bellbirds or tūī, across the vast stretches of agricultural land between us and the nearest populations, but someday, our kōwhai and flaxes, along with the neighbours’, may very well support a healthy population of native birds. All it takes is for each of us to care for our own backyards, and collectively we can improve the habitat for all our native species.